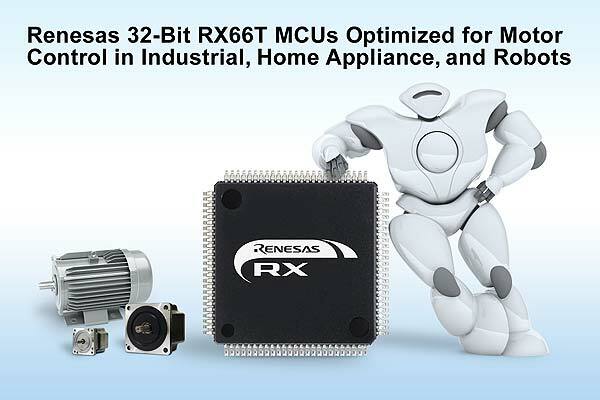 Renesas Electronics Corporation today unveiled the RX66T Group of microcontrollers (MCUs) – the first members of Renesas’ flagship 32-bit RX MCU family based on the new third-generation RXv3 CPU core. The new MCUs leverage cutting-edge CPU core technology to achieve substantially improved performance1, as much as 2.5 times better than previous RX family MCUs. Combining the powerful new RXv3 core with the strengths of the current RX62T and RX63T MCUs, the new RX66T MCUs address the real-time performance and enhanced stability required by inverter control. The new MCUs are ideal for use in industrial applications in next-generation smart factory equipment, such as industrial motors, power conditioners and robots, as well as smart home appliances, including air conditioners and washing machines. For more information on Renesas’ Motor Workbench development support tool, please visit: http://www.renesas.com/us/en/software/D3017970.html. For more information on Renesas’ motor control solutions, please visit: https://www.renesas.com/solutions/proposal/motor-control.html.